2- vista mansarda panoramica sul castello: 1 letto matrimoniale e 1 camera doppia adiacente per un totale di 4 posti letto che dispongono di un ampio bagno con doccia e vasca ad angolo, una cucina con lavanderia e una fantastica 'Lamia' (terrazza salentina) con vista il castello medievale per una cena indimenticabile sotto le stelle. Viste spettacolari delle feste folkloristiche con luci che brillano sui fuochi d'artificio e sul castello barocco. Un luogo ideale per costruire la tua vacanza ideale: spiaggia, cultura, tradizioni, relax, ecc. POOL aperta dal 1 maggio all'11 novembre di ogni anno. Dieser Palazzo ist sehr groß, sehr aufwendig und schön renoviert, sehr gut ausgestattet, sehr zentral in einer reizenden Kleinstadt gelegen und wird von Andrea sehr gut verwaltet. Wir haben uns dort alle sehr wohl gefühlt! We spent most of the summer of 2018 at this amazing home in Poggiardo. 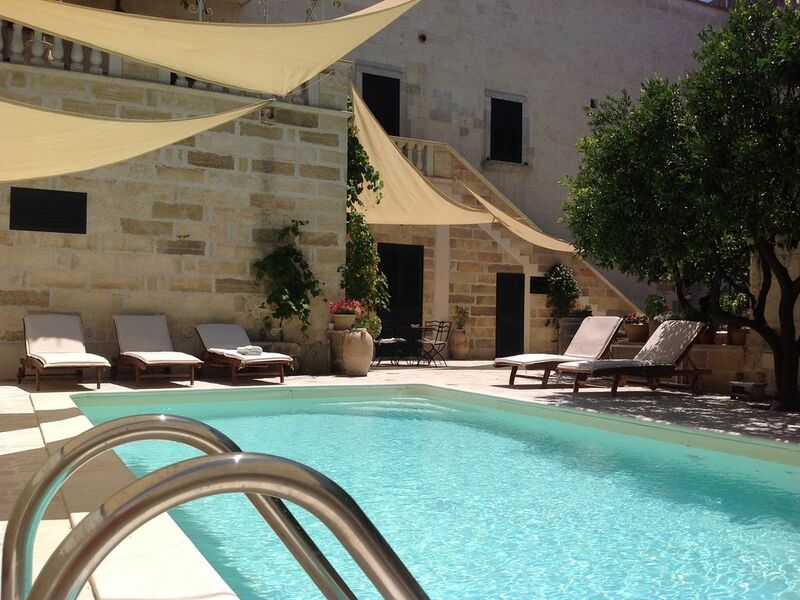 It makes an outstanding home base to explore Salento! First, Poggiardo is a perfect town to call "home" in Salento. The people are welcoming, the town is not pretentious or touristy, most things are walkable for your daily needs. You can easily have coffee and pastry, explore local streets and shops, fix lunch al fresco at the villa, and then dine out deliciously in any number of great restaurants just steps from your door. Then head for the coast -- most of Salento's beaches are an easy day trip. Do you want rocky pools or sandy stretches? Maria can answer any particular questions you have. There are many free beaches within 30 mins as well as numerous "Lido" establishments that offer a range of amenities for a fee. The nearby towns are breathtaking. You can wander happily for hours with some new charm around every corner. We especially loved Castro and Lecce. Most have great choices for Salento cuisine -- with crazy fresh ingredients from the nearby sea and farms. We even made a day trip up to explore Trulli country -- also amazing. The driving is easy and parking is manageable for free or for a small fee (paid at a kiosk with cash or card). The house is more amazing than the photos show. It is spacious, and it offers everyone someplace to relax. Maria and Andrea have done such a tasteful job throughout. We frequently had a houseful (including children) and made the most of the pool and all the outdoor spaces. Maria and Andrea respond immediately to questions or concerns you may have. They are committed to being great hosts and sharing this spectacular part of the world with visitors. Stay longer than you think you should. There is so much to enjoy. Ti aspettiamo ancora....grazie per avere scelto Palazzo Umberto per le tue vacanze. Sei stata un ospite fantastico. Experience Italian life in a beautiful Palazzo. A beautiful Palazzo where you can live among the locals and experience life in a lovely Italian town. A wonderful home base. We had a week in this amazing house, 10 of us comprising parents and adult sons, daughters and partners. The house is really beautiful, historic, and very well cared for and very special. We loved the outside space, it was perfect for us - the large terrace where we ate breakfast, the large patio beside the pool where we did our yoga each morning, the pool and pavement around it to sunbathe and the garden where we chilled and played boules in late afternoon. It was great to be able to walk out in the evening to a choice of bars and restaurants, and to explore during the day if we wished in cars for which there was also plenty of parking space on site. A fabulous house in the centre of the town, and Maria was so helpful and kind. A beautiful memorable time for us in Poggiardo. We had a great stay in Poggiardo, the villa is beautiful and split over 3 floors - ideal for 2 families sharing as there is lots of space and several kitchen areas. The pool is a great depth for swimming and also for children and the sails provide great shade. The owners were really welcoming and gave us great advise on local resturants and cafes, they also recommended a local company for a super boat trip. The Villa is in the centre of this beautiful small town and has all you need, a supermarket is walking distance, a couple of pharmacies, several great places to eat and an amazing coffee shop/ice cream bar. There is the biggest street market I have ever seen in the town on a Wednesday and you can buy everything here. Other days there is a butcher, a fish monger and a cheese and cured meat shop in the town. Within a short drive are some beautiful beaches and sea caves to explore. There is plenty of secure parking, bikes to borrow, table football and a pool table. You could never be bored here. We will definitely re visit. Thank you Andrea and Mary for a super holiday. thanks we wait you next year!